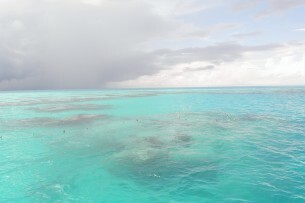 Ominous looking shower slowly approaches our reef on a calm day. Note the floats holding our mooring ropes at the surface so they do not tangle in the corals. Bad weather depends on what you consider desirable and undesirable. Visitors often like sun and dislike rain, both conditions are irrelevant to an enjoyable dive. Though we do need daylight, only strong winds and the accompanying large waves make this program challenging. Folks often falsely conclude that cloudy skies reduce visibility. Strong winds cause larger waves and faster current. The resulting suspended sediment, creates reduced visibility and cloudy water. This is a non-issue because the fish swim right up to us, and we are not forced to snorkel after them, or observe them through many feet of water. There is lots of room to get out of the rain if shower passes. We like water and are not afraid of it. It does not rain underwater. Lightening sounds scary, but has a very low risk of hitting our fiberglass boat. The rule about staying away from water in a thunderstorm, only refers to a small body of well grounded water, surrounded by land (ponds and pools). If the area is all water then lightening will still take the path of least resistance, by choosing a hill, or some other tall object sticking up. We have hills with protruding trees to the east, and 60 foot navigation towers to the west. There is lesser chance of motions sickness, because there are no ocean swells. There is a ring of shallow reefs surrounding the island that stop swells from getting to our area. If it is slightly windy and a chop develops, we are still comfortable, as the boat is always positioned bow into the wind. Anchors can come loose or hurt reef, so we secure the boat with four of five mooring ropes. If you know you are sensitive, take something an hour before the tour. If caught by surprise we have drugs, acupressure bands, ginger and Chinese herbs. High winds, especially out of the north, create larger waves. This can create difficulty on the ladder, which would be plunging up and down. Too much plunging is a valid reason for cancelling. Winds from the east, through south to west at 20-25 knots are not a big deal, as the reefs that surround our area. (not the north), muffle and suppress the waves. Cold water is never a problem. We provide full length 5/7mm thick wet suits to keep you warm if the water is below 80F. At the beginning of the season when the water is below 70 degrees, we pour warm water down the suit, both before and after the dive. We also have hot chocolate. We provide some processed snacks food (If you are discriminating bring consumables you prefer), pure Bermuda water, black currant fruit drink in the summer, changing room and toilet. Rainbow Runner has a large hard cabin with glass windows. Do not worry about sun, wind or rain. If the weather is likely to cause harm to you, me or the boat, we cancel.